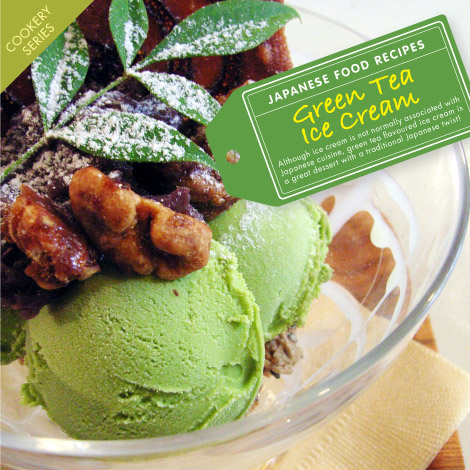 Although ice cream is not normally associated with Japanese cuisine, green tea flavoured ice cream is a great dessert with a traditional Japanese twist. It is widely available in Japan and East Asia and is becoming more and more popular in the West too. A great colourful dessert to impress at any dinner party! 1. Begin by mixing two tablespoons of granulated sugar with the matcha green tea powder in a bowl. 2. In a separate bowl, mix the remainder of the granulated sugar with the egg yolks. 3. Gently heat the milk on a pan without letting it boil. Remove from the heat and mix a small amount of the warm milk with the matcha green tea and sugar and egg mix until it becomes a smooth paste. 4. Gradually add the milk to the rest of the matcha green tea paste while keeping the mixture smooth and then return to the heat. 5. Before the mixture boils, remove again from the heat and then strain the whole mix through a fine sieve to remove any impurities. Leave the mixture to cool before the next step. 6. Whip the cream lightly and then fold into the matcha green tea mixture. 7. Once the mixing is complete, set in a large container and put in the fridge to cool down for a few hours. 8. Finally, you can put the container in the freezer. To stop ice crystals forming in the ice cream, be sure to remove every few hours and mix the ice cream vigourously. Repeat this a few times as it freezes to guarantee a delicious, perfectly smooth ice cream! Posted in Food and tagged dessert, Green Tea, Ice Cream, wagashi. Bookmark the permalink. What do you do with the egg yolks & sugar from step 2 as it didn’t mention in the recipe?! I apologise that I was not clear enough in the recipe. The egg yolks and sugar should be mixed in with the milk and green tea powder in step 3. I hope this helps and good luck with making your ice cream! Would you serve this ice cream with anything? I would suggest Anmitsu, green tea ice cream make the perfect combination.